Because of our remote location, there is no trash pickup at Muleshoe Ranch. We have a couple trash bins where we accumulate bags of trash from residents and guests until we get a chance to take it to the local dump (~one hour away). Over the winter, rodents moved into our trash bins and created quite a mess. Hauling trash bags is not fun; hauling trash bags that are leaking due to being chewed by rodents is just gross. Of course we don’t use poison at Muleshoe because that works its way into the food chain and harms animals other than its intended target, so the trash rodents were getting out of control. Then Spring arrived, and with it, nature’s rodent control: Allison. 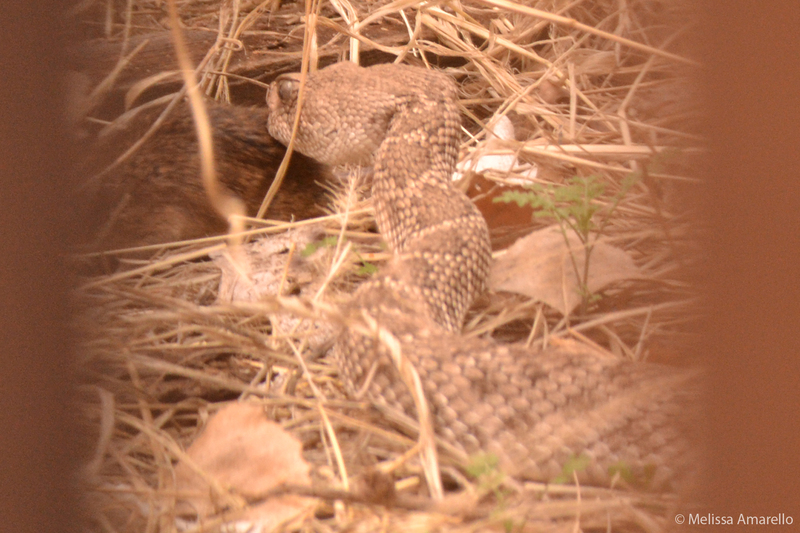 You may have noticed that unlike many of the rattlesnakes pictured on this blog, Allison is often in a defensive posture. 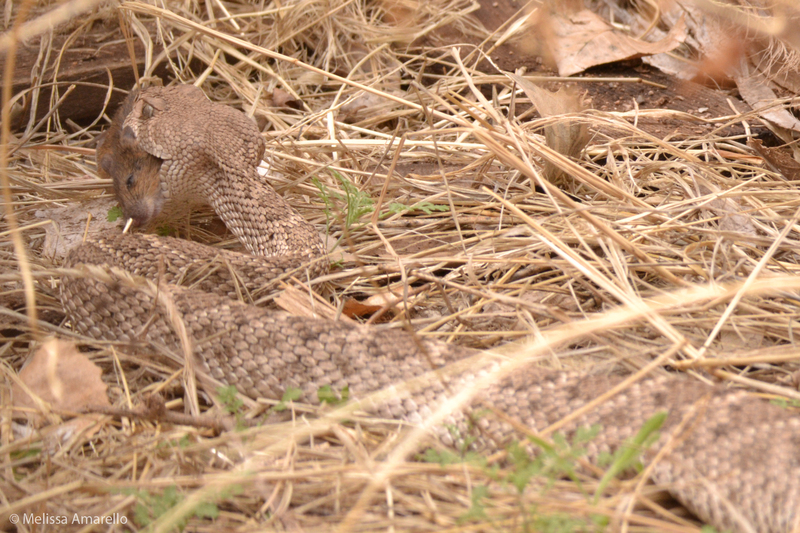 Like most animals, rattlesnake attitudes vary among individuals – you might say they have personalities. Lucky for us, Allison is quick to respond to human presence by rattling and posturing. Why lucky? Many would interpret this behavior as ‘mean’ or ‘aggressive,’ but it probably indicates that Allison is scared of us. 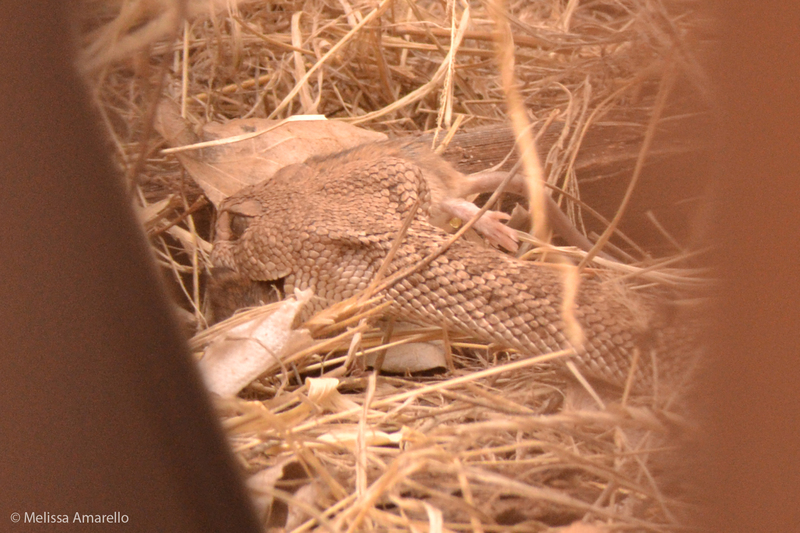 And since she currently lives in a high traffic area for staff and volunteers, it is lucky that our resident rattlesnake alerts us to her presence well before there is danger of stepping on her. Despite regular searches, we didn’t see Allison for nearly two weeks and were starting to wonder if she had moved on. There was still plenty of food (rodents) in the trash area, so we couldn’t understand why she’d want to leave. Then on 25 March, we found a dying rodent near the trash bins. Assuming this was Allison’s latest meal, we set up a camcorder and slipped away. The benefits of having Allison take up residence near our trash bins were twofold. First, she did appear to have an effect on the rodent population – they were less noticeable after she moved in. 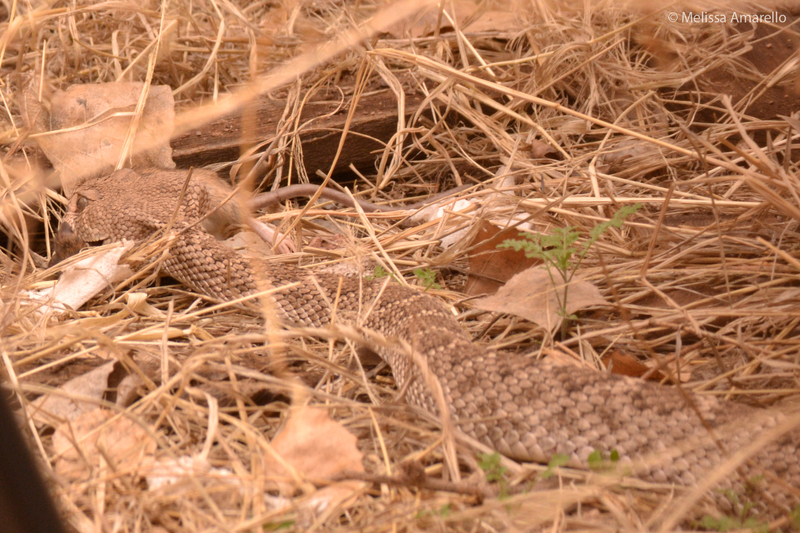 Next, because she was hanging out near the casitas, but usually behind a fence, several visitors got to see a free-ranging rattlesnake in a non-threatening situation. A group of friends who visit Muleshoe every year got to watch Allison eat and a couple young children got to see her up close through the fence. We hope to see much more of Allison in the future.